Delta Chapter of Alpha Gamma Rho Purdue University P.O. Box 442100 Lawrence, KS 66044-2100 Address Service Requested The Delta Messenger A PUBLICATION FOR ALUMNI OF DELTA H ALPHA GAMMA RHO for testicular cancer, will also be held during the spring semester. Alpha Gamma Rho will continue to be involved in other philanthropies throughout the semester as well, including the BMOC fundraising campaign. The men of Alpha Gamma Rho will continue to strive each day to make better men, through brotherhood, campuswide involvement, and ser- vice that will develop the leaders of tomorrow. Fraternally, Zane Gottschalk '15 Chapter President zgottsch@purdue.edu The Ron Memorial Scholarship is presented to Mat- thew Ackmann '14 and Andrew Wullenweber '14. The Hurt Scholarship was presented to the members by Robert Hurt's son and grandson (center). 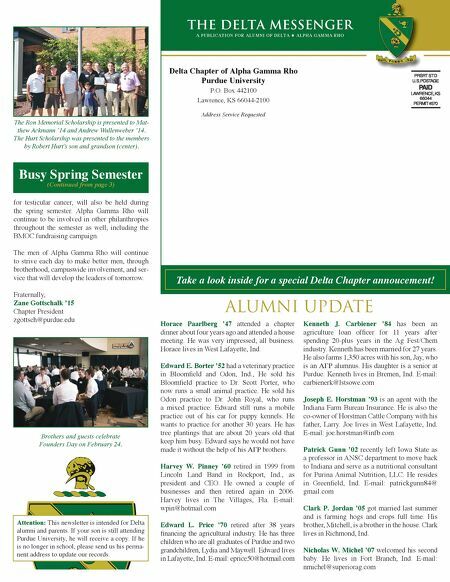 Busy Spring Semester (Continued from page 3) Brothers and guests celebrate Founders Day on February 24. Horace Paarlberg '47 attended a chapter dinner about four years ago and attended a house meeting. He was very impressed; all business. Horace lives in West Lafayette, Ind. Edward E. Borter '52 had a veterinary practice in Bloomfield and Odon, Ind., He sold his Bloomfield practice to Dr. Scott Porter, who now runs a small animal practice. He sold his Odon practice to Dr. John Royal, who runs a mixed practice. Edward still runs a mobile practice out of his car for puppy kennels. He wants to practice for another 30 years. He has tree plantings that are about 20 years old that keep him busy. Edward says he would not have made it without the help of his AGR brothers. Harvey W. Pinney '60 retired in 1999 from Lincoln Land Band in Rockport, Ind., as president and CEO. He owned a couple of businesses and then retired again in 2006. Harvey lives in The Villages, Fla. E-mail: wpin@hotmail.com Edward L. Price '70 retired after 38 years financing the agricultural industry. He has three children who are all graduates of Purdue and two grandchildren, Lydia and Maywell. Edward lives in Lafayette, Ind. E-mail: eprice50@hotmail.com Kenneth J. Carbiener '84 has been an agriculture loan officer for 11 years after spending 20-plus years in the Ag Fest/Chem industry. Kenneth has been married for 27 years. He also farms 1,350 acres with his son, Jay, who is an AGR alumnus. His daughter is a senior at Purdue. Kenneth lives in Bremen, Ind. E-mail: carbienerk@lstsowe.com Joseph E. Horstman '93 is an agent with the Indiana Farm Bureau Insurance. He is also the co-owner of Horstman Cattle Company with his father, Larry. Joe lives in West Lafayette, Ind. E-mail: joe.horstman@infb.com Patrick Gunn '02 recently left Iowa State as a professor in ANSC department to move back to Indiana and serve as a nutritional consultant for Purina Animal Nutrition, LLC. He resides in Greenfield, Ind. E-mail: patrickgunn84@ gmail.com Clark P. Jordan '05 got married last summer and is farming hogs and crops full time. His brother, Mitchell, is a brother in the house. Clark lives in Richmond, Ind. Nicholas W. Michel '07 welcomed his second baby. He lives in Fort Branch, Ind. E-mail: nmichel@superiorag.com Alumni Update Attention: This newsletter is intended for Delta alumni and parents. If your son is still attending Purdue University, he will receive a copy. If he is no longer in school, please send us his perma- nent address to update our records. Take a look inside for a special Delta Chapter annoucement!